The man convicted for attempting to traffic adults and children to Ireland has been released because court documents went missing. Court of Cassation at the Justice Palace in Brussels. A MAN THAT HAD been convicted in relation to the deaths of eight refugees that were on their way to Ireland has been freed from prison after court documents went missing. Het Laatste Nieuws, a Dutch newspaper based in Brussels reports that the man had previously been convicted for the death of the eight refugees, including three Turkish children, who died on board a ship that was sailing from Zeebruge to Ireland in 2001. The 33-year-old from Serbia never turned up for his sentencing but despite his absence was sentenced to ten years for the crime. The case resurfaced in 2012, when investigators finally managed to track down the man down. 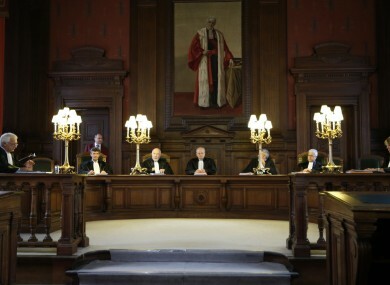 The Belgian Court of Cassation, the court of last resort in Belgium, suspended the earlier verdict of ten years in prison because some documents turned out to be missing from his files. The man was released and a new trial will take place before the Court of Appeal in Antwerp. Migrants Rights Centre Ireland Director Siobhán O’Donoghue told TheJournal.ie that this case illustrated the desperate measures people are forced to take in order to support themselves and their families. If we are serious about reducing human smuggling, we need to face up to the need for legal and safe channels of migration; right now, Europe’s hostile immigration policies are playing into the hands of criminals willing to exploit the desperation of vulnerable people. As we have seen with the recent deaths in Lampedusa and in Niger, people are still being forced to take these desperate measures. Is this what we want from Europe? Email “Man convicted in relation to deaths of immigrants on their way to Ireland freed on technicality”. Feedback on “Man convicted in relation to deaths of immigrants on their way to Ireland freed on technicality”.